The trick is to catch yourself when it’s happening and get back on track. For the last three months, I’ve been complaining about not seeing deer in our backyard. Now, if you’ve been with me for a while, you know I’m crazy about deer. I love their elegance and beauty and feel such delight whenever they come to visit. I’m always on the lookout for them in the yard and usually snap photos to post on Facebook or to text to friends. In addition to affirming what I wanted, I began to feel grateful for the deer already being here. Out loud, I often said to myself: Thank you deer for coming to visit. Thank you for enjoying our grass. Thank you for being here and sharing the land with us. 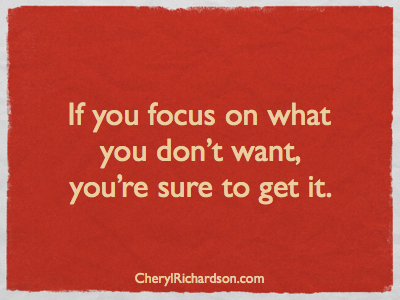 If you keep complaining about not having a job, or the fat on your hips, you’re giving energy to what you don’t want. But now you know how to turn it around, too! This week’s video gives you a chance to hear a vintage recording of Louise Hay talking about shifting negative thoughts to positive ones. I love her voice… You can listen to Louise here.